Korean Peninsula Tense After North Shells Southern Island President Obama pledged the U.S. would defend South Korea after the North shot dozens of rounds of artillery onto Yeonpyeong island, near their disputed western border. Two South Korean marines were killed. The South Korean army fired back, deploying fighter jets to the area. 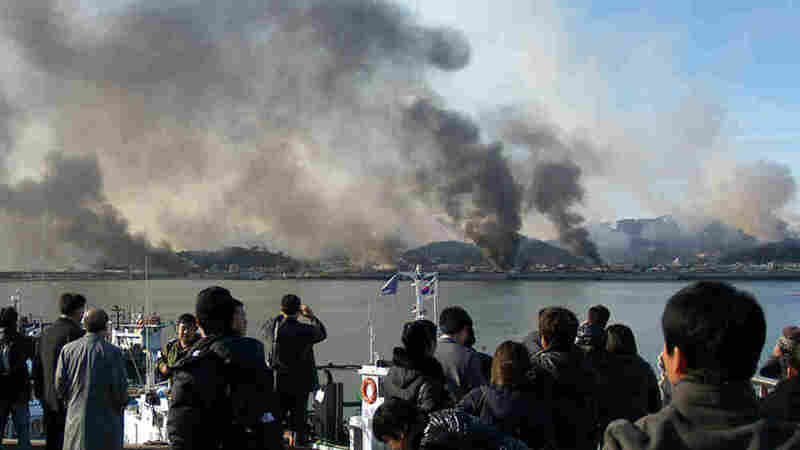 This picture taken Tuesday by a South Korean tourist shows huge plumes of smoke rising from Yeonpyeong island in the disputed waters of the Yellow Sea after an exchange of fire between North and South Korea. President Obama pledged Tuesday that the United States would defend South Korea after what the White House branded an outrageous attack by North Korea on its neighbor. "South Korea is our ally. It has been since the Korean War," Obama said in his first comments about the North Korean shelling of a South Korean island. "And we strongly affirm our commitment to defend South Korea as part of that alliance." The president, speaking to ABC News, would not speculate when asked about military options. He was expected to telephone South Korean President Lee Myung-bak late Tuesday night, and he met into the evening with his top national security advisers to discuss next steps. Earlier Tuesday, South Korea vowed "enormous retaliation" should North Korea launch another attack after Pyongyang's forces rained artillery shells on an island along a disputed sea border, killing two South Korean marines and wounding more than a dozen people. The shelling began around 2:30 p.m. local time, according to South Korean military officials. The North fired about 200 rounds, and the South returned fire with about 80 rounds of artillery and scrambled fighter jets in an exchange that reportedly lasted an hour. It is considered one of the most serious exchanges in years between the two nations. North Korea claimed that troops from the South, which was holding military drills at the time, were the first to fire. The communist country also threatened more attacks if provoked by South Korea. At least 16 people, including civilians, were injured on Yeonpyeong island, about 75 miles west off the coast. Emergency officials said mountain fires were spreading and that most residents had fled to bomb shelters in nearby villages. It was not immediately clear whether there were casualties in the North. YTN TV said shells were still falling on Yeonpyeong. The station broadcast pictures of thick columns of black smoke rising from the island, which has a population of about 1,600. Screams and chaotic shouts could be heard on the video. South Korea's Joint Chiefs said the "inhumane" attack on civilian areas on Yeonpyeong violates the 1953 armistice halting the Korean War. The two sides technically remain at war because a peace treaty was never negotiated. Top South Korean officials gathered at an underground bunker at the presidential compound for an emergency security meeting. 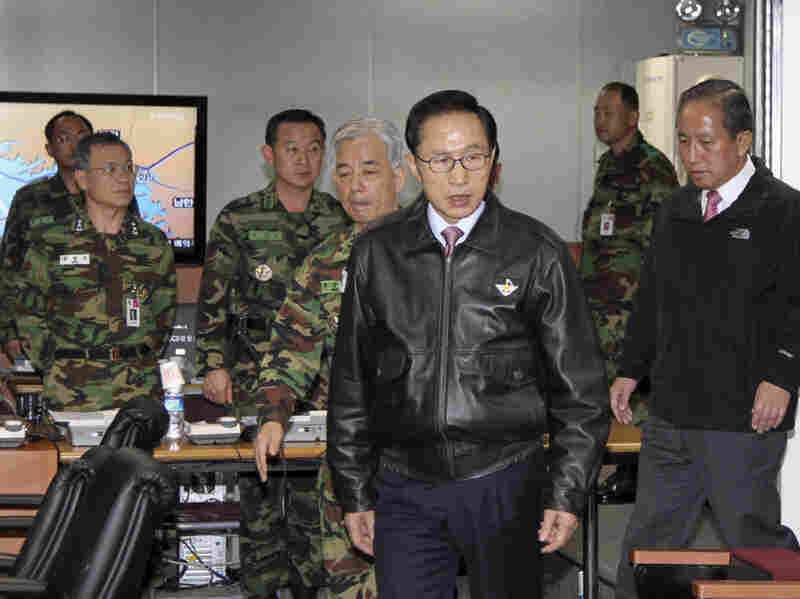 President Lee Myung-bak called the attack a clear military provocation and raised the country's security alert to its highest peacetime level. "Enormous retaliation should be made to the extent that [North Korea] cannot make provocations again," Lee said. He added that an "indiscriminate attack on civilians can never be tolerated." Tensions between the two nations have been high since North Korea's recent decision to reveal what it claims is a new uranium enrichment facility to a visiting American scientist, and after the sinking of a South Korean warship in March that killed 46 sailors. Seoul blamed a North Korean torpedo, while Pyongyang has denied any responsibility. Tuesday's skirmish also comes just six weeks after North Korean leader Kim Jong Il unveiled his youngest son, Kim Jong Un, as his heir apparent. The United States, which has tens of thousands of troops stationed in South Korea, condemned the attack and called on North Korea to "halt its belligerent action," White House Press Secretary Robert Gibbs said in Washington. He said the United States is "firmly committed" to South Korea's defense, and to the "maintenance of regional peace and stability." A senior Obama administration official said the president was awakened shortly before 4 a.m. by National Security Adviser Tom Donilon, who updated him on the exchange of artillery fire between the two Koreas, according to The Associated Press. North Korea's supreme military command threatened to continue military strikes against South Korea if it violated their disputed sea border "even 0.001 millimeter," according to the North's official Korean Central News Agency. The shelling occurred as South Korea was holding military drills in the area. North Korea's military had sent a message to South Korea's armed forces early Tuesday to demand that the drills stop, but the South continued them, another military official said. During the drills, South Korean marines on the island shot artillery toward southern waters, away from North Korea, the official said. Both officials spoke on condition of anonymity, citing military rules. After the North's barrages, South Korea responded by firing K-9 155 mm self-propelled howitzers, military officials said, but they declined to say whether North Korean territory was hit. The small South Korean-held island of Yeonpyeong, which has been the focus of two previous deadly battles between the Koreas, houses military installations and a small civilian population. Yeonpyeong is known for its crab fishing and is surrounded by about 30 small islands. Lee Chun-ok, a 54-year-old island resident, said she was watching TV when she heard sounds of artillery and a wall and door in her home suddenly collapsed. So why did Yeonpyeong island become a target for North Korean artillery shells? A large part of it is location, location, location. The tiny Yellow Sea island, controlled by South Korea and fortified by a garrison of South Korean marines, lies 75 miles off South Korea's coast. But it's just 8 miles from North Korea, which also claims possession of Yeonpyeong. And if you extend the demilitarized zone dividing the two Koreas into the sea, Yeonpyeong is only 2 miles south of that border line. Just a year ago, South Korean military experts cited in The New York Times pointed to the island as a likely spot for a limited battle if North Korea sought to provoke one. Fewer than 2,000 civilians live on the island, which is essentially a large fishing village. Many are from families who fled the North during and after the Korean War in the 1950s. Most are considered anti-Communist, much in the way Cubans living in Miami have long rejected the Castro regime. 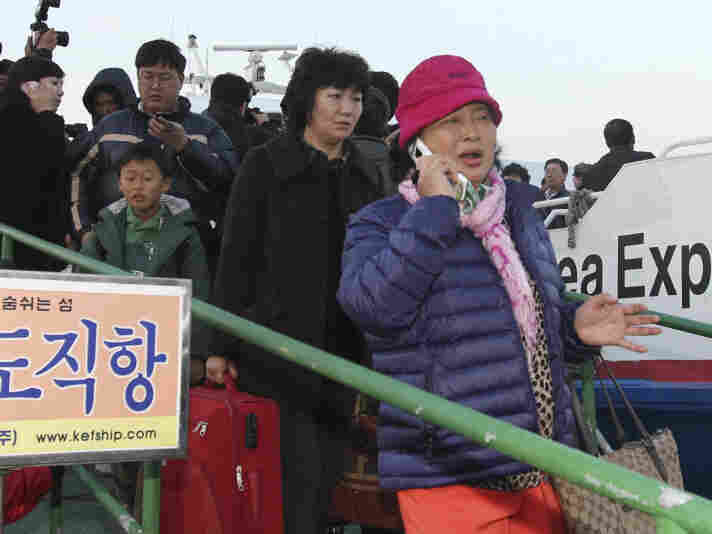 "I thought I would die," Lee said from the port city of Incheon, west of Seoul, where she took refuge. "I was really, really terrified, and I'm still terrified." China, which is the North's economic and political benefactor while maintaining robust commercial ties with the South, called for calm. "We express our concern over the situation. The situation is to be verified," Chinese Foreign Ministry spokesman Hong Lei said at a regularly scheduled media briefing in Beijing. He called on both Koreas without naming them "to do more to contribute to peace and stability on the peninsula." North and South Korea have fought three bloody skirmishes near the maritime border in recent years, most recently in November 2009. That battle left one North Korean officer dead and three others wounded, according to South Korean officials. 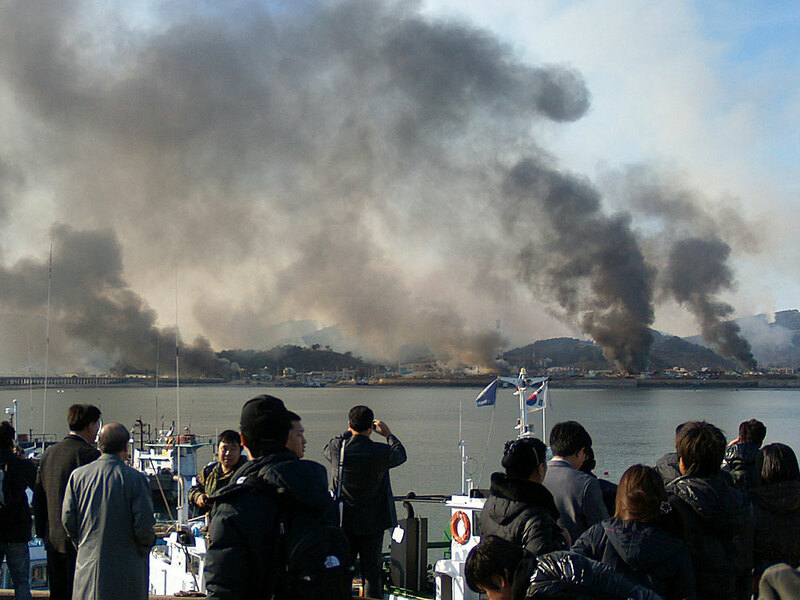 Two deadly clashes have previously erupted around Yeonpyeong. In a gun battle in June 2002, one South Korean warship sank, killing six sailors. The North said it also suffered casualties, but didn't confirm how many. In a 1999 clash, South Korea said several sailors were wounded and up to 30 North Koreans died. Brian Myers, an international studies professor at South Korea's Dongseo University, told NPR that the conflict is somewhat perplexing because ties between the two nations had been improving in recent weeks. But Selig Harrison, director of the Asia Program at the Center for International Policy, believes that the attack on Yeonpyeong is "a classic ploy" by North Korea's military to undermine the thawing relations. Harrison, author of the book Korean Endgame: A Strategy For Reunification and U.S. Disengagement, told NPR that he believes there's a clash between a faction led by Kim Jong Il and another, harder-line one led by the military. "The armed forces hawks don't like what they are seeing, and what they have done is a classic ploy in situations like this to stir things up and undermine the doves," he said. Harrison, who has traveled to North Korea nearly a dozen times, said he believes it's a myth that Kim is in total control. "His father, Kim Il Sung, was the head of a Stalinist regime, but when he died in 1994, there was essentially a coup by the Korean military," Harrison said. "Kim Jong Il is not the absolute ruler that he's popularly believed to be in the West." With reporting from Michael Rhee and Doualy Xaykaothao in Seoul and NPR's Louisa Lim in Beijing. This story contains material from The Associated Press.